Researchers at Princeton University haven't just created a functional ear; they've actually manufactured some that may work better than our human ones. 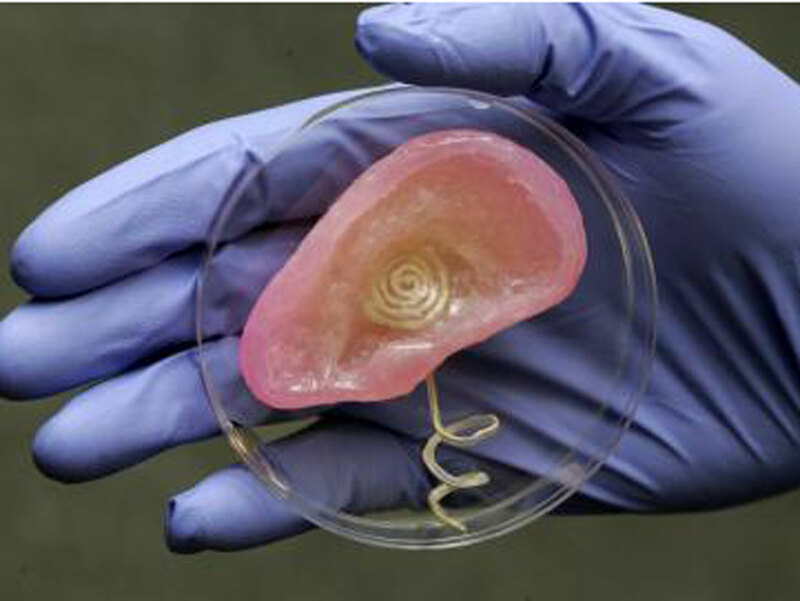 Nicknamed the "bionic ear," the operative device can hear at frequencies far out of the range of a normal human ear. These ears were made using a 3D printer, a device which has been used recently to create a working gun and a human kidney. During the State of the Union address President Obama called the technology the future of manufacturing. This project was the first to attempt to not only recreate a functional human organ, but to make it more effective by using electronics. Researchers printed cells and nanoparticles, followed by a cell culture to implant a small coil antenna with cartilage. "In general, there are mechanical and thermal challenges with interfacing electronic materials with biological materials," Michael McAlpine, an assistant professor of mechanical and aerospace engineering at Princeton said in a statement. "Previously, researchers have suggested some strategies to tailor the electronics so that this merger is less awkward. That typically happens between a 2D sheet of electronics and a surface of the tissue. However, our work suggests a new approach -- to build and grow the biology up with the electronics synergistically and in a 3D interwoven format." While this wasn't the first 3D printed organ, it was the first time that researchers demonstrated that they can use this technology to "interweave tissue with electronics." This is no easy task as the materials needed to make a human ear are very different from those in electronic devices. "Biological structures are soft and squishy, composed mostly of water and organic molecules, while conventional electronic devices are hard and dry, composed mainly of metals, semiconductors and inorganic dielectrics," David Gracias, an associate professor at Johns Hopkins and co-author on the publication, said in a statement. "The differences in physical and chemical properties between these two material classes could not be any more pronounced." The "bionic ears" aren't ready to be used and McAlpine cautions that these prototypes need more research before they could be implanted on a patient. The researchers published their findings May 1 in the scholarly journal Nano Letters. Watch the video below to see these ears being created.